I love the idea of a winter wedding. What better time to be married than during that magical season of sparkling snow, cozy fireplaces, and an abundance of holiday spirit? I can just picture all the wonderful details coming together: ice blues, winter whites, snowflake shaped sugar cookies, white poinsettias, and decorative sleigh bells. If you couldn’t tell, I hope to one day have my own winter wedding! I am a firm believer that a wedding’s smallest details are often its most charming ones. 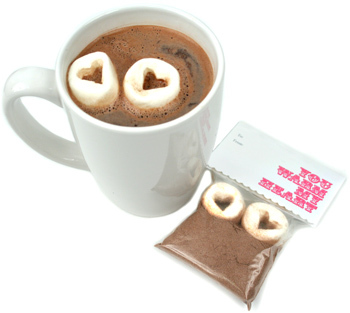 The other day, flipping through the pages of Brides magazine, I thought of a detail that would be perfectly adorable for a wintry celebration: hot chocolate with heart-shaped marshmallows. 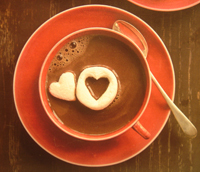 I love hot chocolate — always have, always will. It’s one of my favorite simple pleasures. Anyhow, I pulled up Google on my computer and looked up heart-shaped marshmallows, expecting to find very few options. I was surprised to discover there are many DIY options, as well as a number of varieties for purchase. I cannot to wait to have these some form of these puppies at my own wedding someday!